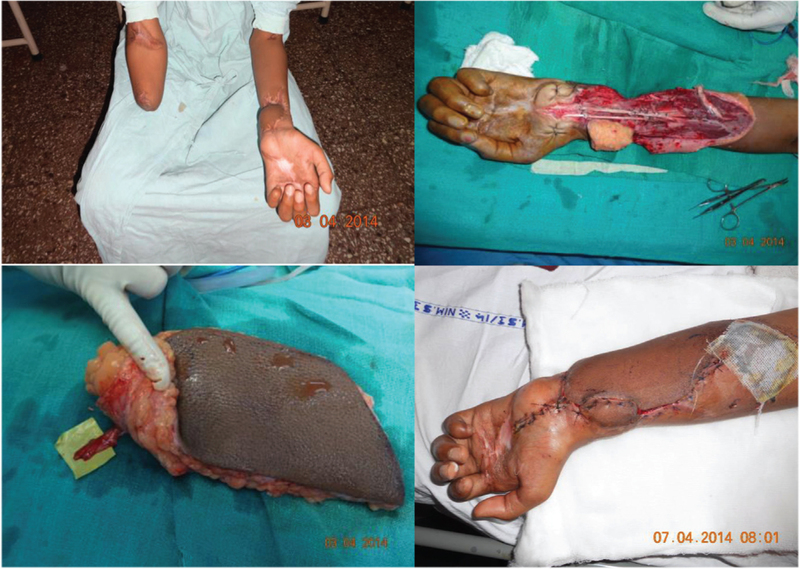 Introduction: A total of 10 patients underwent single-stage reconstruction of high-voltage electrical burn sequelae at the distal forearm and volar wrist, in patients with complete loss of motor and sensory function of the hand; all 10 were operated using interposition tendon grafts for the flexor digitorum profundus, nerve grafts for the median and ulnar nerves and the anterolateral thigh flap (ALT) for coverage; in addition, the fascial component of the flap was used to wrap the repaired finger flexors. Materials and Methods: All the flaps survived, and eight of the 10 patients had S3 or S4 recovery of median nerve sensation. Results: The final outcome measurement was done by adopting a variant of the abbreviated upper extremity functional index. The mean value for this was 19 of a possible 40 points (range in 10 patients −7 to 28). Discussion: Single-stage reconstruction using short tendon grafts and nerve grafts is a useful procedure in high-voltage electrical burns. Conclusion: The use of the ALT with vascularised fascia permits early finger flexor activity suitable for activities of daily living. High-voltage electrical burns frequently involve the upper limb where the decreased cross-sectional area inflicts maximal damage to vital structures that compromise prehensile function of the hand. There is a delay in diagnosis on account of the ‘tip of iceberg’ nature of the wound where the skin involvement is much less than the injury to the deeper structures. Multiple sites of burns and systemic manifestations may delay early priority for the upper extremity that is required for its timely salvage. The presence of dead tissue permits the ingrowth of microorganisms by 72 h and this coupled with a local decrease in arterial perfusion causes an escalation of the initial insult. Studies have documented that an early aggressive debridement, with distal revascularisation and early flap coverage before infection sets in, permits salvage of hand prehensile function. Once infection sets in, then there is a reluctance to do aggressive debridement, as delineation of infected and non-infected tissues may not be clear; furthermore, when the main axial vessels are injured as in forearm volar burns, it may be a collateral circulation that is providing blood to the hand and in this situation aggressive debridement may damage existing collaterals, thus compromising hand vascularity. Local or less often free flaps can provide preliminary skin cover to be followed by functional reconstruction after 3 months when the flap has ’settled’. Skin defects may be covered by local, distant or free flaps, depending on the conditions of the local wound, adjacent area and donor site and general condition of the patient. Restitution of lost extrinsic finger flexion [often only the flexor digitorum profundus (FDP)] follows the ‘reconstructive ladder paradigm’-tendon suture, tendon graft, tendon transfer and functioning muscle transfer. A free skin flap can be combined with the necessary reconstruction in a single stage to telescope the period of rehabilitation. Global assessment of hand function and a defined end point of reconstruction are needed for successful management. The study included patients with high-voltage electrical burns of the distal forearm and volar wrist presenting beyond 72 h of injury (EC/NIMS/1676/2015 16th ESGS No. 295/2015). These patients had one or more of the following clinical findings: inability to flex the fingers and the thumb at the interphalangeal joints (IPJs); extrinsic flexion contracture as evidenced by a positive Volkmann’s sign; loss of skin in the volar forearm and/or adherent cutaneous scarring; loss of sensation in median nerve (MN) and/or ulnar nerve (UN) territory in the palm and fingers and loss of one or both of radial and ulnar arteries in the wrist. None of them were able to use the hand functionally effectively in day-to-day activities [Figure 1][Figure 2][Figure 3][Figure 4][Figure 5][Figure 6][Figure 7][Figure 8]. Amount of skin loss, apparent and actual that would result after excision of the wound and/or cutaneous scar. Capillary filling and the presence or absence of radial and ulnar pulse, augmented by a Doppler exam. Sensory testing of the palm and the hand. Actual range of motion of finger and thumb flexion if present. Innervation of the intrinsic muscles. Availability of the donor thigh with Doppler exam for presence of suitable perforators. Debridement of necrotic tissue and/or skin scar, sloughed tendons and synovium. Reconstruction of flexor tendons to the finger by interpositional tendon grafts. Nerve grafting for segments of injured MNs and/or UNs. Using the anterolateral thigh flap (ALT) for skin coverage and the fascial component of the flap as a gliding surface for the reconstructed tendons. Skin loss over the volar forearm only. No clinically useful range of finger flexion preoperatively. No deep burns in the palm or fingers that would have needed a skin graft or skin flap in that location. No significant loss of proximal muscle mass on account of atrophy as measured by mid forearm circumference difference from the normal side. Documented loss of tendon after debridement was from the musculotendinous junction to the distal limit of the carpal tunnel only. Patients with circumferential loss of skin with or without scar. Patients who had undergone a previous functioning muscle transfer. Surgical exploration of forearm and hand done under exsanguination and tourniquet control; excision of the ulcer beyond the margins through healthy skin and the cutaneous scar if present was done; all sloughed, scarred tendon and synovium were excised down to the surface of the pronator quadratus. Isolation of the normal structures proximal and distal to the wound zone by extension of the incision proximally and distally. Recipient pedicle chosen for end-to-end anastomosis − whichever pedicle was interrupted due to the injury was chosen and the intact pedicle left to perfuse the hand; if both were cut or were intact, then the radial pedicle was chosen and the decision to transect was taken only after applying microvascular clamp proximally and the distal perfusion checked after tourniquet deflation. Two veins − one superficial and one deep − were chosen for the venous drainage of the flap. All flexor tendons were freed off the scar and the lack of continuity noted; only the FDP was selected for reconstruction; in addition, the flexor pollicis longus (FPL) was selected for reconstruction when the distal end was available and deemed suitable; normal distal tendons were found behind or at the distal end of the carpal tunnel; the transverse carpal ligament was released; the tendons of flexor digitorum superficialis (FDS), flexor carpi radialis (FCR) and palmaris longus (PL) were harvested as and for tendon grafts when there was a loss in continuity due to the burn; the FCR and PL were selectively used as donor tendons; in addition, the brachioradialis was selectively used as donor tendons for motorising the FPL if indicated. Injured segment of the MNs and UNs was resected and the defect bridged with sural nerve cable grafts coapted with 10 ‘0’ monofilament nylon; the use of pedicled single-stage vascularised nerve graft was done for MN reconstruction in select cases. Tendon graft coaptation was done using a combination of 3 ‘0’ and 4 ‘0’ polypropylene suture ensuring that the fingers fell into cascade position. Even though a formal opponensplasty would have been difficult primarily, available motor tendons, usually brachioradialis, were transferred to the abductor pollicis brevis (APB) tendon to permit a functional thumb position in the abducted position using a tendon graft in select cases. The dissected ALT isolated on its pedicle was always harvested with the underlying fascia and detached after circumscribing adequate skin needed in the forearm; anastomosis was done end-to-end in one artery and two veins as stated above after partial inset of the flap to prevent inadvertent detachment. Complete flap inset was given only after confirmation of perfusion after completion of the microanastomosis; this was preceded by separation of the underlying fascia of the flap as a pedicled fascial flap to isolate the repaired flexor tendon unit from the underlying wound bed assisted by sutures of 4 ‘0’ polyglecaprone; passive tube and glove drains were kept under the flap and split skin graft applied over residual raw areas including over the pedicle if required. An above elbow plaster was applied keeping wrist in neutral, metacarpophalangeal joint (MPJ) of fingers in 70° flexion, IPJs extended for 6 weeks. Early active mobilisation of fingers was started after 5 days with at least two times to three times daily; the patient was discharged between 10 and 12 days; during discharge, the above elbow plaster was converted to a below elbow plaster. Active flexion and extension were allowed within splint for 6 weeks and dorsal blocking splint removed at 6 weeks. Resistive exercises were started after 8 weeks and activities of daily living after 3 months. Suitable splintage was recommended for the first web to prevent adduction contracture. All through the physiotherapy protocol, patients were closely monitored and assisted. Patients were followed up to 2 years to monitor tendon function, recovery of nerves and need for ancillary procedures. The final outcome measurement was done by adopting a variant of the abbreviated upper extremity functional index (UEFI). This considers the patients’ ability to perform activities of daily life (ADL). A total of 20 different activities were considered and the rating as experienced by patient was recorded. The total best score was 80; higher scores correlated with a better outcome. Any of your work, housework, school activities. Lifting a bag of groceries to waist level. Lifting a bag of groceries above the head. Carrying a small suitcase with the affected limb. The total number of patients who underwent short tendon grafting for finger flexors and nerve grafting for the MN and the alt with fascial extension were 10; all were males. Age ranged from 14 to 33 years, with the mean age being 23 years [Table 1]. The time since burn to presentation for reconstruction was 3–15 months with a mean duration of 8 months. All the patients had a flat hand with metacarpophalangeal joint (MCPJ) extension and IPJ flexion of the fingers and an adducted thumb with flexion deformity IPJ of the thumb. Six of the 10 patients had no motion of fingers and thumb; four of the patients had minimal finger flexion but no useful range of motion. Skin scar with adherent structures: 6. Skin scar with a previous flap: 2. Loss of MN and UN function: 8. Loss of MN function only: 2. Complete loss of flexor tendon continuity: 6. Partial continuity present with adherent scar: 4. Hence, six patients had restoration of continuity of the FDP using short tendon grafts and four had reinforcement of the partially intact tendons after scar release using tendon grafts. Both MNs and UNs repaired using sural nerve graft: 6. Graft for MN and UN neurolysis: 3. Pedicled vascularised ulnar to median graft single stage: 1. Brachial artery end to side: 1. In six patients, two veins were used − one superficial and one venae commitantes of the relevant artery; in four, only one superficial vein was used. There were two re-explorations for venous congestion with redo vein anastomosis; all 10 flaps were successful. Restoring function of abductor pollicis brevis using brachioradialis and interposition tendon graft to keep the thumb in palmar abduction was done in nine of the 10 patients. Tenolysis done in two patients. 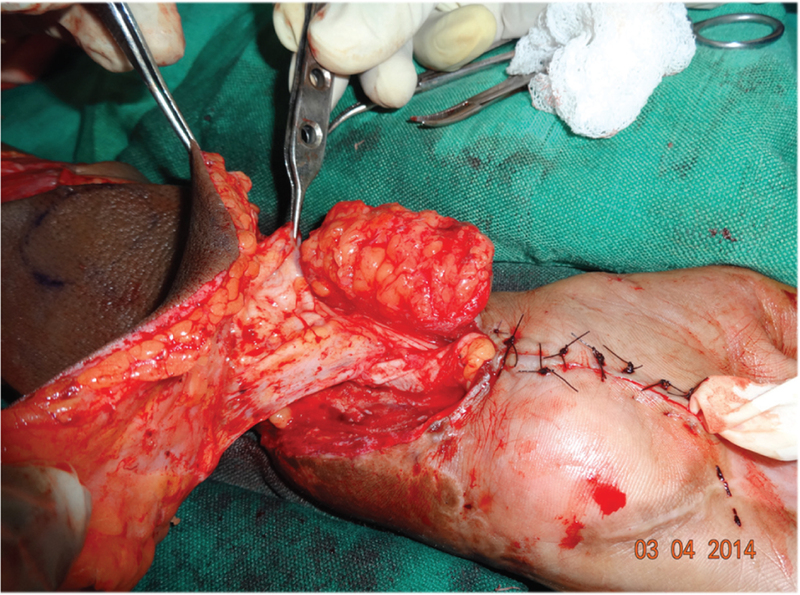 Short tendon grafts done in eight patients using the native FPL (four patients) or the flexor carpi (four patients). Two patients had S4 recovery. Six patients had S3 recovery. Two patients had S2 recovery. Palmar abduction: In six out of nine patients, thumb abduction was satisfactory, which is useful for holding large objects (span grasp). Four of the 10 patients had residual extrinsic flexion contracture of fingers as evidenced by a Volkmann’s sign; none of them recovered any intrinsic function of thumb or fingers. Abbreviated UEFI values for 10 patients: for a maximum total of 40 points. 18, 28, 18, 26, 22, 19, 19, 18, 7 and 15: mean value was 19 and the median was 18.5. 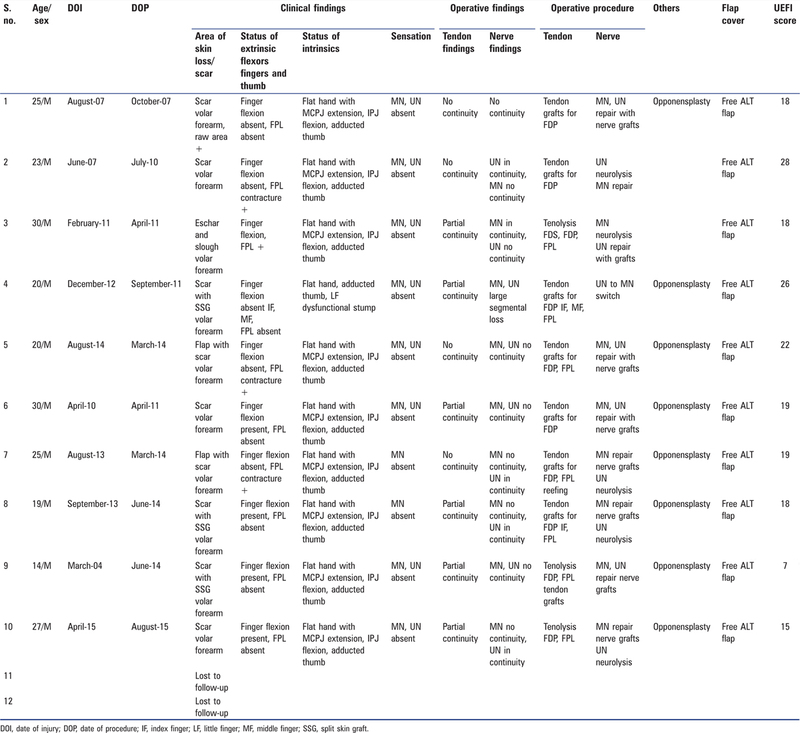 Many of the published articles of the outcome of free tissue transfers in burns focused on secondary reconstruction of high-voltage electric burns. The main treatment principles for electrical trauma are well established; decisions taken during the initial stages may significantly influence the patient’s future quality of life. Other reports, indicating that functional outcome is not satisfactory following these traditional procedures, have suggested early thorough debridement and flap cover when vital structures are exposed. As the versatility and variability of free flaps have significantly increased during recent years, so have the indications for free tissue transplantation in burn reconstruction expanded. The worst of volar forearm burns do not have the extrinsic finger flexors, MNs and/or UNs may be injured and the intrinsics may be paralysed; hence, there is a compulsion of operating more than once; so a flap cover and major reconstruction in the same stage are likely to be of advantage. There are few articles in the literature that have focused on patients who have presented beyond 72 h of the injury and hence are not applicable for early debridement and flap coverage only as the delay has caused loss of the functional elements of the hand and forearm. Ideally, reconstruction should begin with debridement and soft-tissue cover of some kind but combining coverage and reconstruction telescopes the period of rehabilitation, which is otherwise prolonged in these severe injuries. Restitution of lost extrinsic finger flexion (often only the FDP to prevent intertendinous adhesions) follows the ‘reconstructive ladder paradigm’-tendon suture, tendon graft, tendon transfer and functioning muscle transfer. Tendon suture by the very nature of the injury is never feasible in these cases. Tendon grafts are prone to adhesions in the avascular bed. The presence of intact musculotendinous junction of the proximal FDP is a necessary caveat for tendon transfers if useful function is to be gained. Tendon transfers have a role, and the long extensor of the wrist and brachioradialis are the only donors that may be available in forearm burns; the power of the wrist extensor may not be considered as ’expendable’ in a patient with loss of finger flexion; such few donors as available may be needed also for future intrinsic replacement. In this study, 10 patients have undergone reconstruction of flexor tendon continuity with short tendon grafts, restoration of MN and/or UN continuity with nerve grafts and soft tissue cover with free ALT. There were no flap losses and the single-stage approach permitted the confident use of short tendon grafts for restoring finger flexion; here, the use of the vascularised fascia component of the ALT permitted early mobilisation and probably the prevention of tendon adhesions that would restrict movement. The use of the ALT with its vascularised fascia permits a single-stage restitution of finger flexion and MN sensation to provide useful hand function where none existed earlier. Intrinsic transfers to position the thumb and the MPJ of the fingers can be done later to augment hand function further. Neligan PC. Extremity Burn Reconstruction. 6th ed. London, New York, Oxford, St. Louis, Sydney, Toronto: Elsevier Saunders; 2012. Koul AR, Patil RK, Philip VK. Early use of microvascular free tissue transfer in the management of electrical injuries. Burns 2008;34:681-7. Karki D, Singh AK. The distally-based island ulnar artery perforator flap for wrist defects. Indian J Plastic Surg 2007;40:12. 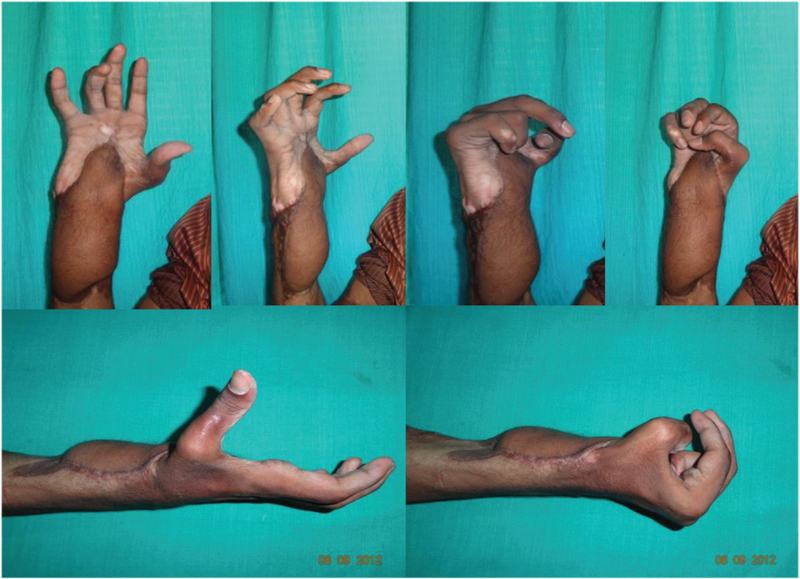 Ashfaq F. Upper extremity burn reconstruction with reverse flow flaps: Indications and utility. Pak J Surg 2013;29:195-8. Chesworth BM, Hamilton CB, Walton DM, Benoit M, Blake TA, Bredy H et al. Reliability and validity of two versions of the upper extremity functional index. Physiother Can 2014;66:243-53. Landecker A, Macieira L Jr. Penile and upper extremity amputation following high-voltage electrical trauma: Case report. Burns 2002;26:806-10. De Lorenzi F, van der Hulst R, Boeckx W. Free flaps in burn reconstruction. Burns 2001;27:603-12. Pan CH, Chuang SS, Yang JY. Thirty-eight free fasciocutaneous flap transfers in acute burned-hand injuries. Burns 2007;33:230-5. Sabapathy SR, Bajantri B, Bharathi RR. Management of post burn hand deformities. Indian J Plast Surg 2010;43:S72-9. Karam E, Lévesque MC, Jacquemin G, Delure A, Robidoux I, Laramée MT et al. Building a multidisciplinary team for burn treatment − Lessons learned from the Montreal tendon transfer experience. Ann Burns Fire Disaster 2014;27:3-7. Stefanacci HA, Vandevender DK, Gamelli RL. The use of free tissue transfers in acute thermal and electrical extremity. J Trauma 2003;55:707-12. Harii K, Ohmori K, Ohmori S. Utilization of free composite tissue transfer by microvascular anastomosis for the repair of burn deformities. Burns 1975;1:237-44. Shartzer LA, O’Brian BM, Harton CE. Clinical applications of free tissue transfer in burn patients. J Trauma 1975;15:766-71. Muneuchi G, Suzuki S, Ito O, Kawazoe T. Free anterolateral thigh fasciocutaneous flap with a fat/fascia extension for reconstruction of tendon gliding surface in severe bursitis of the dorsal hand. Ann Plast Surg 2002;49:312-6. Cormack G, Lamberty BG. Lower limb. The Arterial Anatomy of Skin Flaps. 1st ed., vol. 205. London: Churchill Livingstone; 1989. p. 225. Elliot D. Staged tendon grafts and soft tissue coverage. Indian J Plast Surg 2011;44:327-36. Wehbé MA. Tendon graft donor sites. J Hand Surg Am 1992;17:1130-2. Muuronen E, Asko-Seljavaara S, Tukiainen E, Härmä H. Free flap reconstruction in massive upper extremity burns. Eur J Plast Surg 1990;20:7-10. Barrie KA, Steinmann SP, Shin AY, Spinner RJ, Bishop AT. Gracilis free muscle transfer for restoration of function after complete brachial plexus avulsion. Neurosurg Focus 2004;16:E8. Reddy DM, Rao DV, Koul AR. 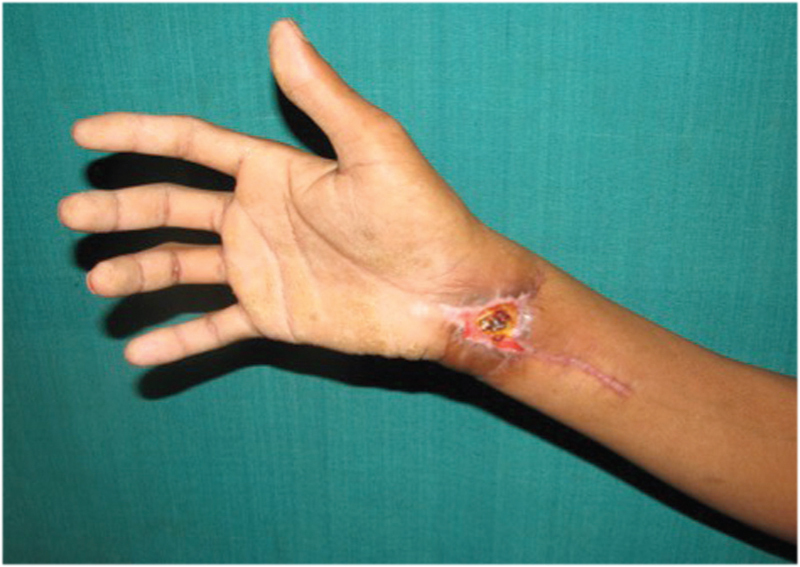 One-stage reconstruction of post-electric burn forearm and hand defects using microsurgical transfer of an ulnar neuromyotendinocutaneous unit. J Reconstr Microsurg 1998;14:33-8. Hamilton CB, Chesworth BM. A Rasch-validated version of the upper extremity functional index for interval-level measurement of upper extremity function. Phys Ther 2013;93:1507-19. Libberecht K, Lafaire C, Van Hee R. Evaluation and functional assessment of flexor tendon repair in the hand. Acta Chir Belg 2006;106:560-5.